PERSEUS IS THE CHOSEN ONE… AND KNOWS FUNK FU! Funk is the music of Gods. Zeus, the father of all of them, created and shared it with the rest of the Universe. The humans have been dancing to and singing funky songs since the birth of time and give thanks to Zeus for receiving this blessing. Now, however, Pagan Titans have created other rhythms in the form of Pop, Rock and Rap and they are using them to influence the humans, turning them into empty headed, dancing minions. In these difficult times, Zeus has summoned his son and Funky Champion, Perseus, to confront and defeat the Titans. Guide Perseus through more than 40 levels of ancient Greek mythology spread over the three worlds of Pop, Rock and Rap. Collect different helmets and weapons, compete in bonus stages and ride Pegasus to glory. Only one style of music can survive and the Funk is the music of the gods. 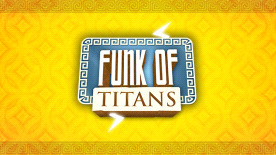 Funk of Titans developed by A Crowd Of Monsters, published by Merge Games Ltd. © 2015 A Crowd Of Monsters. Funk of Titans and A Crowd Of Monsters are trademarks or registered trademarks of A Crowd Of Monsters. Merge Games is a trademark or registered trademark of Merge Games Ltd. All other trademarks, copyrights and logos are property of their respective owners.